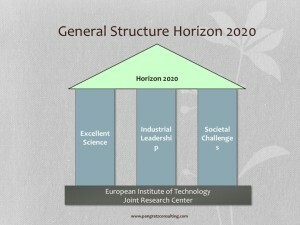 The European Union launched the Horizon 2020 programme late December 2013. Ingemar Pongratz from Fenix Scientific AB / Pongratz Consulting has together with Sofia Kuhn been very active in these initial stages and we have supported organizations, authorities and companies in preparing Horizon 2020 proposals. The proposals that we have been actively involved in include both single stage and two two-stage proposals. The practical participation in several topics has also provided us with first hand experience on which are the difficulties that our clients experience in the proposal development process, and also in general where the main difficulties arise. Once you have identified a suitable topic we will go through the topic and identify the keywords and aim of the topic so that you can plan the best possible proposal and bets possible consortia. We can provide support in this process and we will use our networks to make the process as efficient as possible. We can also help you with the administration of the proposal process and help you administer the contacts with the partners. We can also help you write specific sections and also help you with the specific section. Needless to say, the examples above are suggestions and we are open to other alternatives. We always strive to offer the best possible Horizon 2020 proposal assistance. So please feel free to contact us so that we can discuss your specific needs.